OUR CURRICULUM focuses on history and literature, with an emphasis on those events, traditions and ideas that nourished a sense of social responsibility and gave rise to social action. It includes references to relevant parallel traditions, and seeks to apply the lessons of our past to contemporary events. Each week, music, Yiddish language and current events, arts and drama projects, enliven and enhance the academic curriculum. Holiday celebrations and special outings will include families and friends. For children too young to read or participate in an academic curriculum, the Holiday Class will meet several times before Holiday celebrations (Chanukah, Purim, Passover) for stories, music, and crafts projects. Folktales and stories relevant to our focus on history and social justice, and an introduction to some Yiddish words and phrases. Games, artwork and story-telling will enrich the content. Stories from the Shtetl: how people lived, worked, celebrated and struggled. Stories, poems and plays by Sholem Aleichem and I.L. Peretz make vivid the values and culture of the Eastern European shtetl. Children will act, write, draw and re-create a shtetl. From Shtetl to Sweatshop: Immigration, tenement life, sweatshop conditions, building labor unions, then and now. Stories and poetry, speakers and field trips will illumine the history as well as the present. From Medieval to Modern: The Golden Age in Spain: Jews, Muslims and Christians coexist in peace. The Inquisition and the Marranos; the Holocaust and resistance. Identity: Who am I, and why? Who defines us? Readings from literature and philosophy, current and historical. Anti-Semitism, racism, religion, secularism, Zionism, internationalism. Social responsibility: from the prophets to the picket lines. Pertinent Bible stories, the abolitionists, the Civil Rights and anti-war movements, issues for today’s activists. Graduation: Students select a subject for in-depth study and personal reflection, which culminates in a project to be presented at their graduation. They will help shape the graduation ceremony. We will publish a journal comprised of their work. OUR STAFF is made up of educators who have experience in the progressive, secular Jewish outlook that comprises the foundation of the Kinderland Shule. Several of our staff members were among the founders of the 1981 Kindershule and have remained in leadership over many years; several are alumni for whom shule was a key element in developing their Jewish identities. 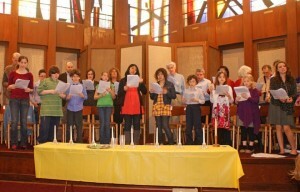 Our teachers are skilled in art, music, Yiddish language, and literature. All share a child-centered, loving philosophy and a commitment to this unique community and cultural heritage.